I may have mentioned a thing or two about our gorgeous weather over these past couple of weeks and it’s probably quite obvious that I have been absolutely loving it. Last Sunday I couldn’t help but get out and do some yard work as the weather was just perfect. I took a picture of the bushes that I trimmed back. Just for fun, as our week of perfect weather continued, I decided to take pictures of said bushes to see their greening progression. 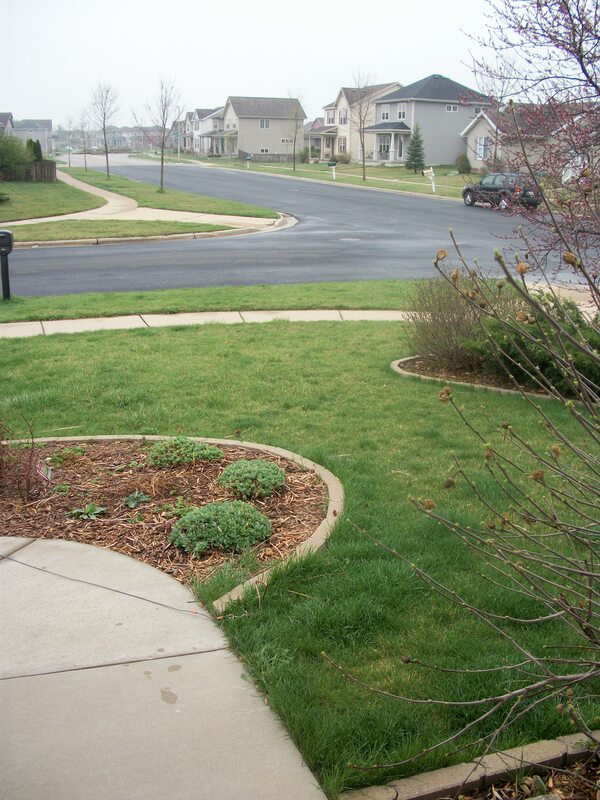 Here’s how things are greening up, in just less than a week! Fielder finally got a haircut this week. While en route to the groomer, I realized I messed up the time of his appointment and we were going to be early so we made a quick pit stop at one of our favorite parks. While I’m afraid of taking Fielder to an actual dog park (have I mentioned my irrational fear of something bad happening to him? 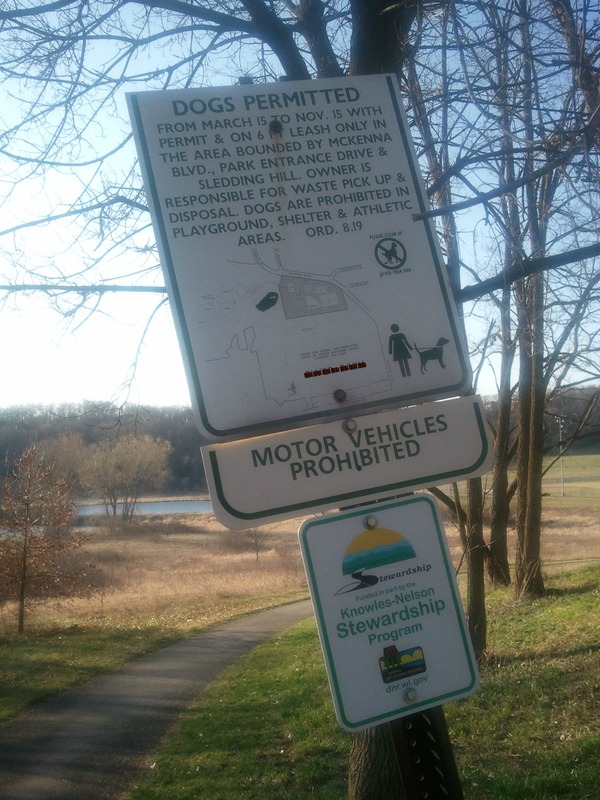 ), I do love taking him to some of the other dog-friendly parks in the area. 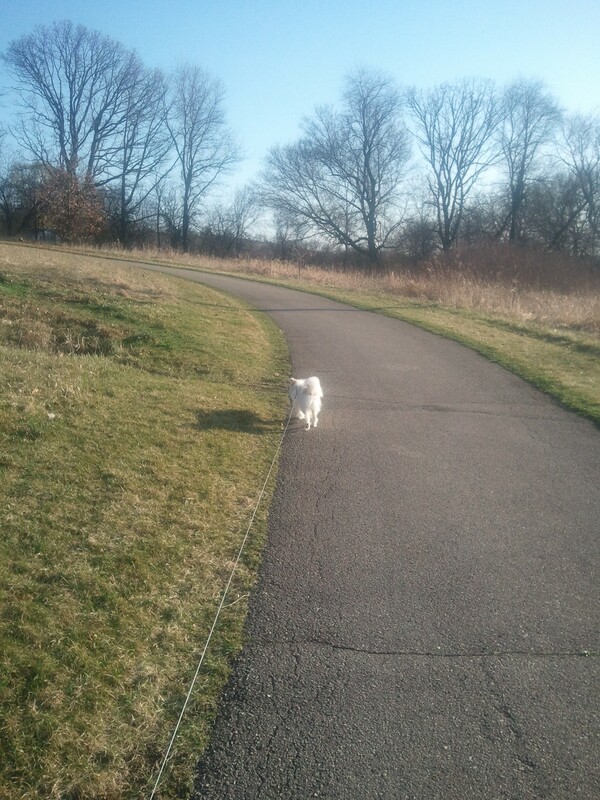 This dog always has to be at the very end of his leash. 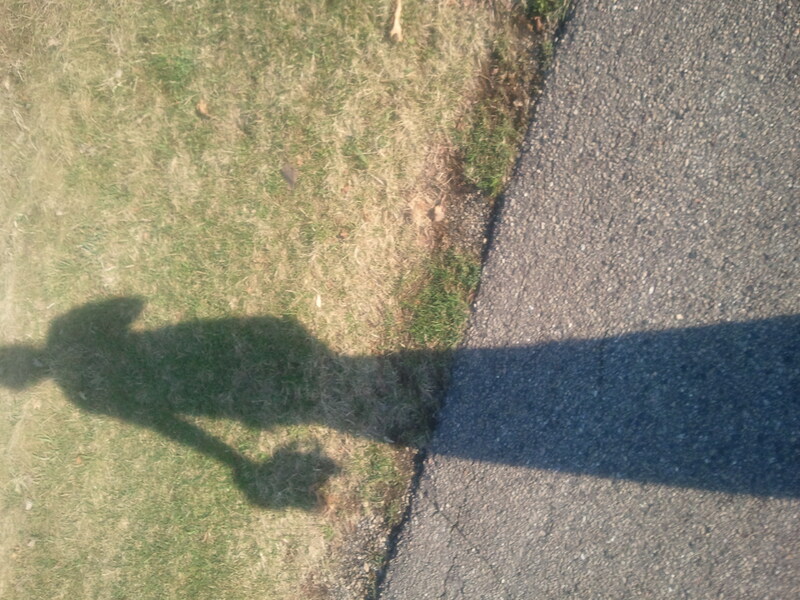 Oh, how I wish my real legs were as long as my shadow legs. Have I ever mentioned that Fielder is a total momma’s boy? Well, this picture is a prime example. 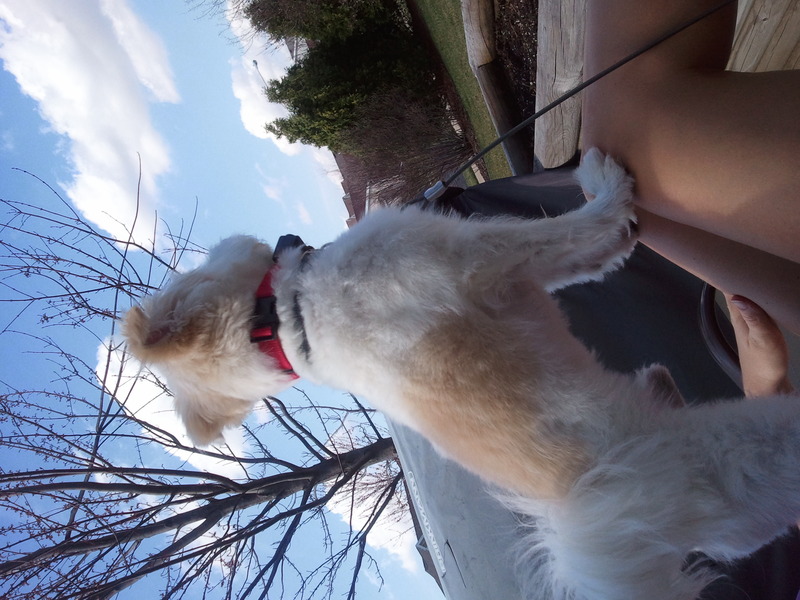 Most dogs would love to explore the yard, chase after squirrels, etc. Not this dog. 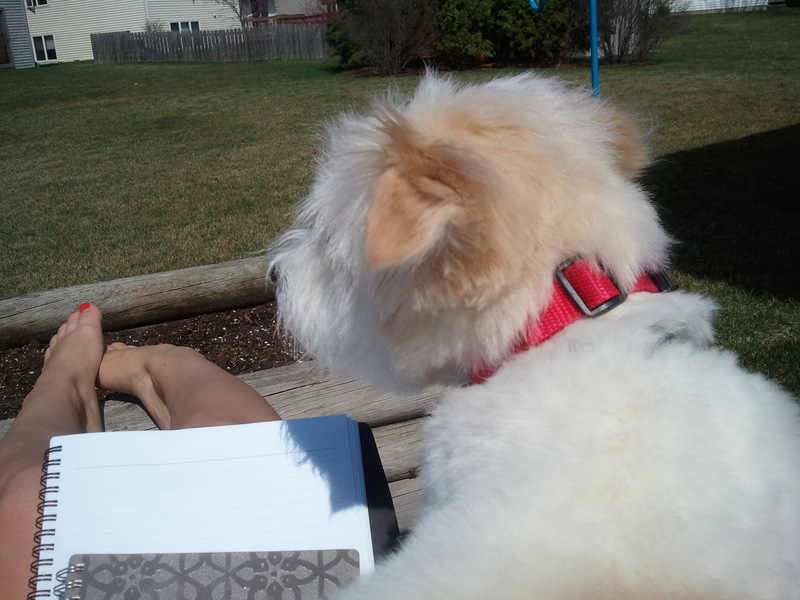 Nope, he’d rather sit on my lap while I attempt to get work done while soaking up some sun. Attempt being the key word. 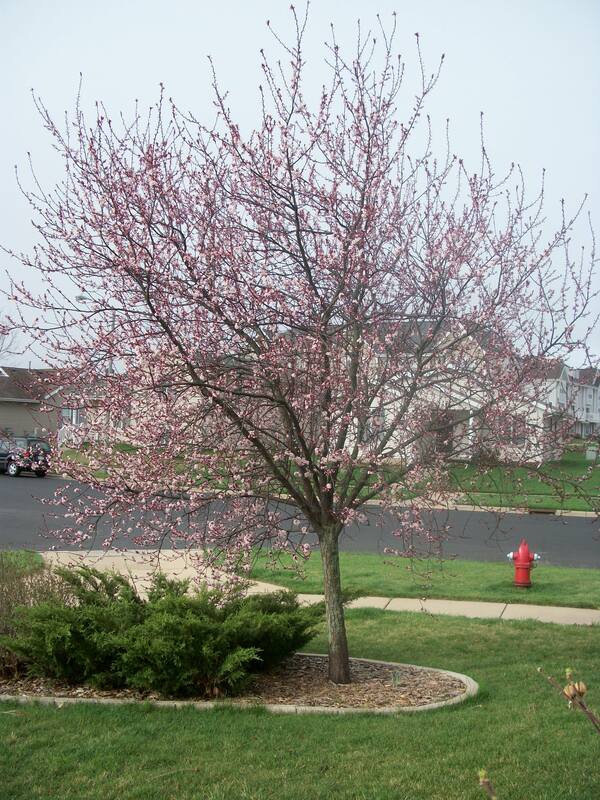 Pretty, blooming tree in our yard. Sadly, today is more spring-like that the summery weather we’ve had. It’s only supposed to be in the 60s and it’s a bit gloomy but still better than our usual March weather! For a change, hubby is at work this Saturday morning and I’m off. 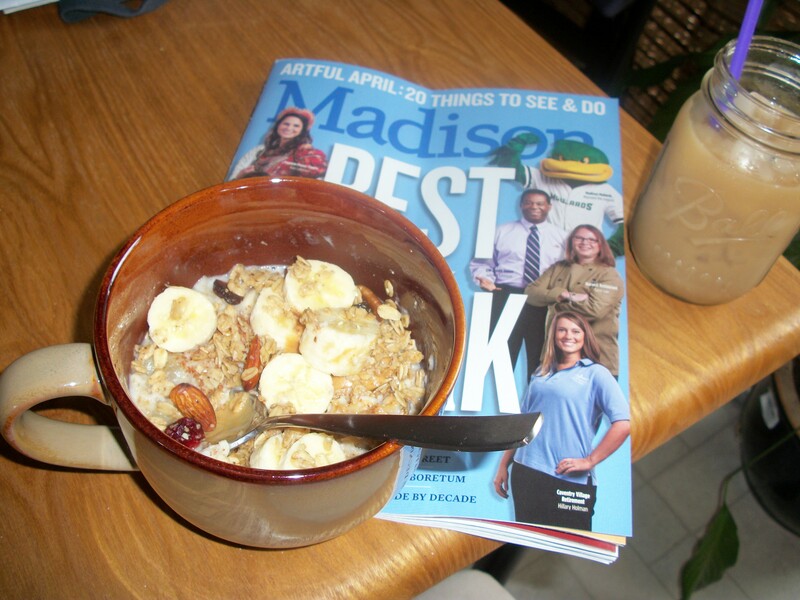 I slept in a bit, got caught up on Google Reader and now I’ll be enjoying some iced coffee, peanut butter banana oats (see below photo for recipe), and Madison Magazine. I’ll also be doing a little Pinterest searching for a salad to take to my parents house this afternoon for a cookout. -Stir together oats, water, milk & half of banana slices in microwaveable bowl. Microwave for 45 seconds, stir, microwave for an additional 45 seconds or until oatmeal reaches desired consistency. -Stir in cinnamon and peanut butter. -Top with remaining banana and granola. Previous Post What I Ate…Tuesday? ?